Withdrawing funds from your trading account is pretty simple. Please note all the fund requests have to placed by you online, as we do not accept offline requests. If you don’t remember your password, you can click on Forgot Password and get a new password. What this means is that if you want to withdraw funds from your Equity trading account, you have to place the request before 7:30 PM, otherwise it will be processed only on the next working day. Similarly with Commodity, you have to place the request before 9:00 AM in the morning. Unlike some stock broking firms which are banks (IciciDirect, Kotak, etc.) we are not and hence the fund withdrawal is not as seamless as it is with them. We at Zerodha bank with HDFC Bank, so if your bank account is with HDFC, the fund withdrawal should ideally happen within the next 3 to 4 hours from when we process (time mentioned in Point 1) as it is an intra-bank transfer. If your account is with any other bank then we upload the details for fund transfers using NEFT/RTGS. This NEFT/RTGS transfer is processed first thing the next day morning by the bank and will be in your bank account before the next day evening. As a policy we say it will take 24 hours from when we process the withdrawal request, but please do understand that once processed the time taken is not really in our hands, it then depends on the time taken by NEFT/RTGS. Note: If you put a fund withdrawal request after Friday 9 AM for Commodities and Friday 7:30 PM for Equtiy, the request will be processed only on Monday. The third Friday of the month is the expiry of global indices, on such days we receive the trade files from the exchange only late in the night as the settlement price depends on the US market opening price. On these days we process the equity fund withdrawal request on Saturday morning. There are times when exchange trade files could reach us late and on all such occasions we process the fund withdrawal requests only on the next morning. Hopefully this clarifies all queries on Fund withdrawals. If I have missed out any do ask me at the end of the blog. YOu can email us a request along with copy of your cancelled cheque of new account. I raised a withdrawal request on yesterday 4pm. And request has been processed. Would the money credited to my account today? Zerodha taking charges on withdrawal of fund. Bec I have balance of RS 8374 and I withdraw RS 8300, where Bal of RS 74 is not showing in my account. You’ll have bought some stocks for delivery and sold them. The proceeds of stock sales can only be withdrawn 2 working days after the sale date as the settlement cycle for stocks is T+2. I have traded and sold a share. And right away after selling it i placed the withdraw request. But it didn’t transferred due to insufficient balance. Even next day also Dashboard showed available balance but Q page didn’t show the balance. How long will it take to show the balance. When can i withdraw. What to do if i want spot sale and intraday withdrawal. My user id is XW0913. I have put a withdrawal request on Thursday which got rejected because of a mistake in my entry. Due to coming second Saturday and Sunday, may be I can get it credited only on Monday. But it’s a bit urgent at family. Can you please look in to it. Only because of urgency, I put it on Thursday, but got a mistake. If you can process and credit it today, it would be really helpful sir. Hi Manju, we would process the payout today, but the credit to your account would depend on your bank. Got it? After how many days from September 7? I want to open Zerodha Trading and Demat account, but we dont have cheque book and online banking. I have Aadhar Card, Pan Card, Voter Card and SBI bank account. Can i open the account online & can we transfer the money to trading account from my brother bank account?? You’ll need a net banking login for transferring funds in any case, so I suggest you get this enabled. Also, without a personalised cheque/bank statement, there is no way to open the account as this is a required document. My 50k trading and demand account fund got refunded from zerodha by an email mentioned that the fund was unused and because of the sebi rule of quarterly refund. It’s very annoying because I was waiting for the right time to buy a stock that’s why I hold that cash in my account. Now again I have to go to my bank and transfer the money by neft back to zerodha. Pls find a solution for this issue. You can send an email to [email protected] asking us to buy liquid fund once a quarter for you. Doesn’t cost anything, but this will ensure that money is not sent back. Commodity withdrawals are processed next day morning. Is there any minimum or maximum value limit for transferring Zerodha to bank account? i have put few laks of fund yesterday into my account. Today, i earned some profit by doing intrday F& O. When i trying to put withdraw request. it is not showing the amount which i put yesterday. It is showing the amount which is available before i put my fund yesterday..Why is it so? When can i withdraw my amount ? Hey Parth, you can only withdraw the funds after T+1 days in case of F&O and T+2 days in case of equity. Check this article for more. I have funds as equity balance but the same is not reflecting in Withdrawal balance. How do I withdraw my funds. When you sell shares, this sale proceed can be withdrawn only after T+2, because this is when even we receive the funds. For example. if you sell shares on Thursday, we receive the funds only on Monday evening (2 working days later) As such, while we allow you to trade with this amount, you can only withdraw on Tuesday. how available balance & account value different ? cant I withdraw total available balance ? Your withdrawable balance is updated 2 days after you’ve sold equity holdings and 1 day later if you’ve closed an F&O position. This is due to the settlement cycle defined by the exchange. Check this article for more information. if the fund withdrawal request for commodities is done before 9 am,can there be a chance to get the money in bank account on the same day through neft transctn..? Just to let you know i am an year old client of Zerodha. I just love trading on Zerodha, would like to have a fruitful and long term association with Zerodha. Thanks, for everything you have for day traders like me. Is there some problem with the backoffice? I have been trying to log into the backoffice using IE browser from evening. However, I keep getting the message ‘Internet Explorer cannot display webpage’. I have tried a few times now intermittently since 5pm and have been getting same message. Is there some site development going on? I would also like to add that I have in the past never had this problem with the backoffice login. Regards. Prathap, are you still facing this issue?? Can you try logging into bo.zerodha.com on your ie browser and let me know if it is working?? Hi, When I place the withdrawal request it usually takes more than 2-3 days to credit in my account. Why there is so much delay when Sharekhan or other service providers are able to credit on the same day or the next day? Ananth, We similar to the broker you have mentioned transfer the funds by the end of the next working day. I guess the reason it might take 2-3 days is as mentioned on the blog, if you place a request on Friday after 7pm or if the next immediate day is a holiday. If there was any case where it took 2-3 days other than for the reasons I have mentioned, send an email with your client id and the date on which you had placed this withdrawal to [email protected] and keep [email protected] in cc. Can you give us instances where there has been a delay so we could check? Note that with regards to the “Withdrawable” balance, the settlement for Equity happens on T+2 and for F&O on T+1. You will not be able to withdraw the funds till they are settled..So basically if you sell stock on Monday, you will not be able to withdraw these funds till Wednesday..
Hello… i placed a withdrawal request yesterday around 6pm. The backoffice shows the status as authorized but still i havent received the money and i am using HDFC Bank. Yesterday was an expiry day and usually trade process takes a while on these days.We cannot transfer funds after 9pm, so on such days we upload the payout request to the bank the next day morning. I guess, you should have it in your bank by now. When zerodha will process the withdrawal request? MAY 1st was a holiday, so if you put in a withdrawal request it will be processed on May 2nd evening. => I started my account in february 2013. Whenever I try to see my ledger details or trade analysis, I can only see the details of the current month(april)..but cant see my trading or ledger details for february and march. P.S: I have uploaded a snip of the error when i try to export details to excel. 1. All data on BO is archived as per financial year, April 1st to March 31st. The reason when you search only data shows from 1st APR is because you are in the present financial year. if i place a withdraw order on friday before 7.30, will the neft transfer be initiated on saturday? We actually initiate it on Friday evening itself(bank gives us time till 9pm). Every 3rd friday of the month is the expiry of global indices on NSE. On this day the trade files are received by us very late(after US opening) and processed only after 9pm. On such days all the NEFT’s are initiated on Saturday morning. I tried to withdraw funds , but the site is not showing anything. it is only showing request withdrawl, but i dont see anything enabled. Could you please be clearer Shiva? if i put a equity withdrawl request on friday morning, will the money credit in my account on saturday? I’m not able to withdraw money back to my bank account linked with Zerodha. 5.Recently I booked some profit by selling some stock and wanna take that profit back to linked bank account. 6.I had Rs.38 before I sold the stock ,which is the clear amount now and the amount I have got after selling is my account balance now.. The settlement cycle for stocks in India is T+2, this means that if you buy stock it comes to your demat in 2 days and similarly when you sell, you get the cash to your trading account in 2 days. You sold on 12th which is a friday, so monday would be T+1 and tuesday would be T+2. So you should be able to withdraw it today. But I did nt get the amount in my account till date. Harsha, There has been an issue with SBM where all the fund withdrawals was reversed on monday. We are reprocessing this today, so you should have it tomorrow morning. Today (July 25, 2013), tried to login into the backoffice around 10:15 AM. First time, i got the following error message as “Internet Explorer cannot display the page”. Next time, the page itself got hang. I tried for manytimes. But i do not have the luck till 11:30 AM. I already the face this issue on Jan 31, 2013. They had given the following other links to login into backoffice. But I failed with the above two links. Then I had sent the mail to the CustomerCare. They replied back with the alternative link which i already known. If your members want to withdraw the money in the emergency situation then it is really bad for them. Are you restricting to use the backoffice for the first two hours (10 – 12 AM) ? We don’t restrict use of backoffice at anytime, it is up 24 hours and might be down occasionally for maintenance or server issues. But it was not down yesterday, do let us know if you face any such issue in the future. Hey Swapnil, I see that the funds were updated immediately. Can you refresh the page and check agian? For me it is sync with your server issue third time. Going forward, if the server maintenance is planned, circulate the mail to the customers so that we can plan ourselves. What is the best solution to withdraw the money in an emergency situation for the customers and unfortunately that time the server is down? Is there any alternate way to raise this request? A server maintenance is definitely planned and is done at a time where the backoffice usage is the least (typically post midnights/early mornings)..Ideally you should not have any trouble placing a request during the day..We prefer our client’s placing withdrawal requests through the system but in case they are not able to we would need an email/telephonic confirmation. I’ve placed a withdrawal request on saturday morning(i.e today) at 8:30 so when i can expect the amount to be credited to my account? As put in the blog above, we don’t process any payouts on Saturday, the payout request you have put today will be processed monday evening. I want to add Indusind Bank as my primary bank for fund pay in and out. Presently it is Axis Bank. Is it sufficient to email you a scanned copy of blank cancelled cheque of Indusind Bank ? Changing your primary bank involves more than simply sending us your new bank details. Since this is very private information, there are regulations which govern it. You have to firstly download the Change of Primary Bank form, fill it, sign it and send it back to us along with supporting documents. The supporting document should be a personalized cancelled cheque with your name on it, or you should send us a 1-month bank statement if you do not have a personalized cheque. Can you please provide the Link to download the Change of Primary Bank form.. I am not able to find it in the Zerodha Site. Thank you. when i try to change password…its showing invalid PAN number though i am entering correct pan number. can you send an email for this to [email protected] someone will get back to you with your new password. i have the password which is used for log in to trading account.But why it is giving invalid user when i try to login?? The password for BO and trading is different. We will reset this password for you. Yes Abinash, You can trade USD/INR on both NSE and MCX-SX with Zerodha. 1) Is it good to use back office or Pay In option (i.e., gateway option) to the transfer funds for Trading or Commodity? 2) What are charges for transferring the funds for Trading or Commodity by the the above options? 3) How to transfer the funds through NEFT to my trading or commodity accounts? What is the account number and IFSC code I should use for these? 1. You can use the payment gateway either on backoffice or trading platform to transfer funds, preferably the trading platform. 2. Rs 9/transfer for using the payment gateway. CLIENT ID IS “RR1444”. I HAD AN INITIAL EQUITY OF RS.76K. MADE SOME PROFITS OF APPROX.30K. HENCE THE BALANCE SHALL BE RS.96K. I ALSO HOLD THE IRB FUTURES & BIOCON CE. KNOW THAT THE MARGIN MONEY WOULD HAVE BEEN DEDUCTED FOR THESE TWO. CAN U TELL ME WHAT EXACTLY IS MY NET BALANCE AND THE EXACT DEDUCTED MONEY FOR IRB AND BOICON CE. I WANTED TO WITHDRAW CERTAIN AMOUNT, IT DEPENDS ONLY I MUST KNOW THE NET BALANCE ALONG WITH POSITIONS I HOLD. SINCE IF I COME OUT OF THESE TWO POSITIONS, EVEN WITH THE BUY VALUE, MY NET EQUITY SHALL BE 96K. PLEASE CLARIFY HOW DO I SEE MY BALANCE AND MARGINS USED FOR THE PRESENT POSITIONS. If you login to the backoffice, bo.zerodha.com (use internet explorer for this), you will be able to see ledger which will show the exact balance in your account and how much is blocked for your existing positions. If you have any query on this send an email to [email protected]. I have linked multiple bank A/c to my Zerodha trading A/c and i could transfer funds from any of these accounts at any time which is great feature and my compliments to you. whereas when it comes for fund payout, i do not have a option to choose the bank which i want and instead get transferred to a default one which you categorize as primary bank. why such Limitation? As a investor if i have a flexibility to transfer funds from multiple banks i think i must have the same facility while payout as well. For example in present case i’m forced to do an inter bank transfer from Bank”A” to Bank”B”, when actually i need the fund at Bank”B”. Hope you got my point? I sincerely request you to introduce the feature in your back office for payout request for the choice within the banks mapped. would you pls be considering this? Transferring funds between equity and commodity is not possible as per exchange regulations. Fund withdrawal bit to different account, we will give it a thought and update you on it. Many thanks for considering my suggestion. Fund payout to multiple banks feature would be a real boon for investors like me. and could you imagine how how much of manual work would be reduced. I really expect you to implement this new feature as early as possible. Pls keep me posted with updates. After witnessing NSEL Fiasco and other Broking firms slowly shutting down their shops. One basic question prevail in my mind. Whether the money and the shares i am going to keep with my broker is really safe? All great companies are not just great because of successful business models but by the way they do the business ethically, i admire TATA’s a lot that’s why they are one of the trusted brand as of till today. I consider Zerodha also the same. Being an ethical business firm, what is the Guarantee/Assurance as a broker does zerodha gives for its Investors for the protection of money kept in trading A/c and shares kept in DEMAT. I want a realistic reply explaining on what way the client money is kept and handled and what all the precautionary methods taken care for protecting investors trading money in case of any unlikely scenario. Hope i get a sensible reply form you. Firstly, our exchanges and regulators have done a brilliant job over the years to ensure that client funds are secure. There is also an investor protection fund setup in case there is a casualty and the good thing to know is that it has not been used even once. Coming back to Zerodha, we have been a profitable business from the start with a QOQ growth and probably among the most profitable retail brokerages in the country. There is zero debts on the books and we are very conservative in terms of leverage. We don’t have any HNI clients who get special deals on leverage or get into any margin funding activity. Some of the reasons above are usually the culprits for bringing down a financial services business and we try to stay as far away from those as possible. Superb……Very Convincing and sensible answer…. Can’t we tie up with banks like SBICapsec has with SBI, they do immediate transfer by marking and un-marking funds from trading account to the bank and vice versa and it is free cost. SBIcap and SBI are basically part of the same parent entity and hence can offer this flexibility. This would not be possible with pure brokerage businesses like us. Placed a withdraw request to my HDFC bank account on a third Friday(Jan-17) evening @6PM. The request is still in pending status. As per the above article the requests will be processed on Saturday morning if we place on third Friday evening.But, the customer care executive says there is no processing on Saturday and i will get the funds only on Monday. is that true? I will not get the funds on Saturday? Yes because of 3rd friday and global market expiry, the withdrawals have been processed today on Saturday. It should be in your bank account in a little while, sorry about our rep giving you misinformation. Thanks for the response. Received the money @12:30PM today(Saturday). 1. I am from Chennai. Do you have office here? If I change my current location(somewhere north or east) in future will this be a problem since Zerodha is basically working from Bangalore? 2. Can the software be used in mobile /smartphone? 4. what is difference between CM segment cash delivery and F&O segment-future? 1. Yes we have a sales office to help account opening, you can see the contact on our website. 2. Yes we have a mobile app that works on android and blackberry, if you have any other phone you can use our html5 application which adapts to a mobile. 4. CM or cash market segment is where you buy stocks take delivery to your demat account and then wait for the price to go up to sell and profit. F&O is futures and option segment, where you can do a lot more, but is riskier than CM, explaining F&O will take a few blogs in itself. Try reading this module. I forgot my bank acc password and it got locked. It will take 24hrs to get unlocked. Can I transfer (Payin) from some other account or it needs a longer procedure of formfilling-hardcopy-mail-enable. I want to know if it can be done before 3pm today. For mapping another bank account, we will need a physical copy of the cancelled cheque leaf. What you can do is, have multiple bank accounts mapped, so in case such an issue happens in the future, you are ready. All fund transfer to the trading account has to be done through the trading platform itself. Will get someone to call you back immediately. i am downloaded and printed account opening form and the attachment file said there is no need to fill the form , only sign on specified areas . zerodha has a team for form filling, is that correct? and one more doubt. what is a cancelled check leaf? i have only bank A/c in union bank of india. can l tranfer fund to and from that bank to zerodha? thanks in advance. Jimmy, Yes we can fill up the form for you. Take a cheque leaf, and write cancelled across the cheque, so no one can use it. The reason for asking a cancelled cheque is to ensure that this account belongs to you. Let me know if you need someone to call you up for help. The details mentioned in the back office often confuses me, one reason for it being that my funds are distributed under ‘BSE – EQ’, ‘NSE – EQ’ & ‘NSE – FNO’. Why are the funds subdivided into these accounts? Can we maintain a single account without these divisions? You haven’t still started using our new reporting tool I guess, check this out. All your funds are together. Thanks a lot, very impressed by the new reporting platform. Hi, Could you please tell me how to transfer funds out of zerodha to my bank account? I don’t see any link called ‘Pay Out’. I only have ‘Pay-in’ link. I am using the web based platform. Appreciate your guidance. You can withdraw it through Q, check this post. I presume there is no daily or other transaction limit for withdrawing funds? Secondly, there are numerous debits in my Zerodha account for delivery based sale transactions (DP charges of Rs 14 each). These become very difficult to track and reconcile. Is there anyway by which Zerodha could pass a consolidated debit once a month for all such charges during a month? Nopes, no daily limit to withdraw. The consolidated debit for DP charges will not really be possible by law. As an alternative could these be rolled up into the related contract notes? For example, stamp duty, SEBI charges, STT, brokerage are all aggregated into a single debit… could this be expanded to include the DP charge as well? Of course, any other possibility of reducing the number of small transactions would be as helpful! DP charges can’t be included in the contract note, unfortunately no way around this. It would be good if back office application can be made available to other browser like chrome , firefox. Guess you haven’t yet checked our new reporting tool Q. Click here. Trading Account Analysis are not avilable. Contract notes is not available yet, but everything else is. Check this post. How many days it will take to get (withdraw) amount from Referral Account Balance ? Referral withdrawal once placed can take upto 7 days. Is there any Withdrawal charge when withdraw amount from referral account amount balance ? SUnil, all you have to do is login to http://q.zerodha.com/ and put a withdrawal request. i dont know about transfering fund to trading account…what is it’s significance..and does whenever i have to trade i shall have to transfer fund to tradind account or it is a single time process untill i use all the fund i had transferred…. 1 time process, once you transfer it stays there unless you want to withdraw it. One thing I have noted is, transferring money from bank account to trading a/c takes just seconds while the reverse takes more time! yes Raj, unfortunately we are not banks and hence can’t give the convenience that someone like hdfc sec, icici direct, etc can give because they are banks as well as brokers. I have used the withdrawal request several times and got the amount credited to my bank account in time, but I need a clarification here. After earning an expected profit any time during the trading session (before the closure) on a day, to lock the profit and to avoid further risk on a fresh trade during the remaining part of the session (which is part of trader’s descipline but often misused) If I place a partial withdraw request immediately, will this amount be blocked and only the remaining balance allowed in ‘limits’ OR is the whole process of client’s withdraw request executed after the end of day’s session ? The process of client withdrawal happens only after close of markets. my bank donot offer MICR code …can i still apply for demat and trading account geting attached with the same bank account..
or if open new account in other bank having MICR code…then for how much time i have to wait to apply for trading and demat account….can i apply after activation of bank account or i have to wait for some time like 6 months or more..
You can open another bank account with MICR and online banking. No need to wait for 6 months, you can open a trading account immediately. then how much amount of money i have to pay for those shares …. Rey, you will need 100% money if you want to hold stocks to the next day. Rey, our brokerage doesn’t change if you trade intraday or delivery, so you don’t have to pay us anything extra. But STT charged by the govt for delivery is 0.1% which is almost ten times higher. Check the charge list. Hi, I placed a withdrawal request at around 5pm on Friday evening, it showed as authorized in the BackOffice, but hasn’t been credited as per now (midnight). My bank account is HDFC so same bank as Zerodha, should I be worried, or is this a standard delay? Prabhat, yesterday the trade process got delayed. You should have it in your account by now. It’s been almost 2 years since blog was posted. NEFT/RTGS timing windows have been expanded and we all take benefit by getting transfers in 3-4 hours max. What is the reason for Zerodha to process only once at 7.30 pm? You have been bringing lots of automation in various other areas then why not in pay out? You can at least consider processing these payouts at least at 2-3 hours interval on Mon-Fri and at least one transfer on Saturday. I’m mentioning only about clear balance (fully settled after selling shares, Not blocked for any purchase). There was a suggestion years ago about allowing selection of bank account during pay out process. Any consideration on it? From monday we will process withdrawals twice. The payout process is not automated, but we are working on it currently. Hopefully in the next few months we will have a solution. Payout to a different bank, hmmm.. will probably take a while. how the intraday futures trading is settled ? when the profits are with drawable ? how much time is taken to get the payment in bank account ? Whenever you buy and sell intraday in futures, if loss then gets debited immediately from your account. If profit, it gets credited the next day to your trading account, which can be withdrawn then. Any withdrawal request put before 7.30pm in the night is processed same day, and you should have it in your bank account the next day morning. (if HDFC, then the same night). Can one place a funds withdrawals through the mobile app of Android 5? Is it through Holdings? Not mobile app, but login to this: https://q.zerodha.com/ and place the request. You can see an option Funds. I have requested a withdrawal now(17:50 1704-2015), would it be processed by tomorrow 11 AM? Yes it ideally should, but sometimes NEFT from the bank might take longer especially on saturdays. I tried to withdraw 25000 but I can’t able to place withdrawal request , it says ” Request Amount cannot be exceeded the clear balance” but in my clear balance is 1,37,530. Venkat, do send these directly to [email protected] with your client id. I Aam new to zerodha.started trading last week . last week my first online payin to my equity account took 2 hours…Today at 7:30 pm i transferred cash to my commodity account but till now(11:30) pm not recieved any balance in my commodity account. eventualy missed a trading oppurtunity today. Moreover it is contrary to the claim on fund transfer page of zerodha.com that online payin is instant. mailed to [email protected] also. pls tell me is there any reason or there is always a minimum delay for payin. my client id RR3905. Ranjay, it should be instant unless something went wrong while u were transferring (if your internet dropped in between or similar). Will get someone to check this out. I have an account with zerodha and demat at IL&FS. I transfer funds from my registered ICICI bank. My doubt is I have traded and sold the shares now will I receive fund to my ICICI bank directly or the funds shall come to backoffice and held until I withdraw from it. It will come to your trading account, you can either use it for fresh trades or withdraw it using backoffice. hii ,when i am trying to login to Backoffice with my client id which i use it for trading . it is always saying invalid clientid/password. can u help me out…. You would have received a separate password for Q, the trading password won’t work. https://q.zerodha.com/, you can use the forgot password option. My brother send me a neft on saturday at 8:40 PM (IST) When it will come at my account. I have recently opened an account with Zerodha, and I applied for an equity fund withdrawal yesterday before 7:30pm, however, right now its 12:26AM in the midnight and when I log into q.zerodha.com backoffice, its showing my account to be NIL(the withdrawal request seem to have processed), but the money haven’t reached my bank account yet. And there is neither any status for “successful withdrawal request processing” nor any NEFT/RTGS details uploaded from zerodha’s side. Would you please explain what’s really going on ? Deb, send these directly to [email protected]. Yesterday was expiry of global indices https://zerodha.com/marketintel/Bulletin/ and hence the trade process etc would have been delayed. Your withdrawal would have been processed late night yesterday, and it will get processed only Sat early morning NEFT/RTGS batch by the banks. I had placed request to withdraw funds on Saturday and when I checked it today on Monday I could not see any status update in Q and the fund was still available, so I had to place a transfer request again today around 8:30PM. Would like to know why the fund transfer was not Authorized. This is the first time I am trying to transfer the funds and hope I have done it the right way. Srinivas, fund withdrawals are not processed on Saturday/Sundays. All of them processed same time on Monday night. Why can I just withdraw a fraction (~0.6%) of account balance? My “Account Balance” & “Withdrawal Balance” has so much difference, why? Account balance includes sum of funds which aren’t clear yet. Eg: If you sell shares worth 1 lac on Monday, your account balance would be 1lac but withdrawal balance 0 cos settlement of shares happens on T+2. 1 lac gets realized from Exchange on T+2 day. This is my new Account with Zerodha. Please let me know if any eligibility exist for funds withdrawal. I just created ticket with support. Note: PI Systems shows the cash balance. You can withdraw as much money as you want, no restrictions. Dear Nitin, while I am very happy with the services provided by Zerodha, one are wherein Zerodha still needs to improve is funds withdrawal. Yes Pranay, working on this. If i make a profit of Rs 10000 from my account balance 20000 will it be possible for me to requst for a pay out of 25000 on the same day? No mujibur, all profits get credited by the exchange on T+1. You will be able to withdraw only Rs 20000 on same day. Whatever options given above those are not applies for new Zerodha trading mobile app. Can you pls suggest how to do withdraw in new Zerodha app. Go to q.zerodha.com, click on funds, and then mention the amount to withdraw. Sir, I made my first withdrawal request on Friday 13th Nov. at 5PM in the evening, but till now I have neither received the funds nor they are available in my zerodha account. Is there any delay? How long I have to wait to get the funds? The payout seems to have gotten rejected. We’ve reprocessed the payout. You should receive it tomorrow. Kudos to you and team Zerodha for all your hard work and making our trading life easier each coming day with your continuous support and innovations. My request is to do something with your fund payout system so that we can transfer money from our trading account to linked bank account instantly by using IMPS service. Please have an option of IMPS payout when we submit payout request using backoffice, so that we can get money in urgent situations. I know that there are charges associated for using IMPS transfer/instant payout (as per bank rules) but it’s ok for you to charge the same who want to transfer the funds immediately. Please do it ASAP. Thanks. Yes Arya, on our list of things to do. Today is my first day in zerodha. Sir my fund is hold in intraday. How can i realease my fund. Actually sir i bought a 8 share from coalindia bt my selling process is not complete. Hey.. Nitin.. I read so much about zerodha on google that how you build zerodha .. Really inspiring story.. I open equity and commodity account with zerodha 2 weeks ago.. I really enjoying trading with you.. Services are good..my trading account is open in just 2 days.. But if you provide some more services mention below than awesome..
2. Provide IMPS service for fund withdrawl.. Charge amount for that. No problem.. But it will definately help someone who is in emergency..
Like me.. I am a student..i use 90% of my savings in my trading account.. So if any emegency arise i have to wait for 1-2 days..
3. I start 60 days challenge in my equity and commodity account.. If i want to withdraw money than i have to wait 60 days or i can withdraw money between challenge..
4. Can you also tell me how to learn technical analysis. Any good website or any institute in Delhi or near about it.. Thanks.. And again i say really inspiring story..for a small age trader like me..
2. On our list to do. 3. You can withdraw money it won’t affect your profitability. I would like to emphasize on point (2). Waiting 1-2 days for emergency funds is way too much time. If not IMPS, at least there should be a batch job that runs hourly during bank day time and processes NEFT transactions within few hours. I placed in a withdrawal request on Friday March 30th at about 4 pm. Till yesterday evening, the backoffice website showed this as ‘Pending Request’. However, till now (Tuesday April 3rd) I have not received the amount. Today when I went to the backoffice website, I do not even see the ‘Pending Request’ and no withdrawal has even happened. Hence I have placed the withdrawal request once more today – and opened a ticket to check what happened and why the delay. I needed this amount by yesterday (Monday) and now I am hoping I will at least get it by Wednesday noon. Hmmm… Yes, this is indeed on our mind as well. We’re trying to figure out a way where we can calculate your available free balance for withdrawal and process batch withdrawals. The passwords to login to Q is different from what you use for your trading platform. On https://q.zerodha.com/ click on Forgot Password to generate a fresh set of passwords. kindly provide transfer fund facility between accounts like Zerodha equity account and Zerodha commodity trading account. it would be very helpful to save the time and money. Both FMC & SEBI do not allow the broker to do internal transfers from Equity segment to Commodities or vice versa even if the trading account is of the same client. If your broker is allowing you to do it, I’d advise to stay away. Recently a broker was fined by SEBI to the tune of 30 lakhs for doing this. Dear Nitin , kindly provide the details about 60 days challenge and also provide the rules . Thanks for the prompt response. So you are also saying the same thing but 234.01 is given after 3pm on T+2 day which I thought would happen in the morning itself. I raised query early morning on T+2 day, but credit of fund happens only afternoon on T+2 day seems to be the main point. Otherwise both our calculations were matching. Any ways I did not track it yesterday after 3 pm, whether funds(234) were freed or not. Today I will do it and raise ticket if I need further clarifications on withdrawal process. Thanks for prompt response. Looks like I was exactly half a day too early for the query. Today I will raise ticket(if needed) only after 4pm. Have raised Ticket #417017 for cash withdrawal. I have been trying to place withdrawal request from 6:45pm onwards today(3 Feb 2015) but everytime funds page in backoffice shows as blank or 500 internal error. So I raised a ticket to treat it as actual withdrawal request. Yesterday also I faced same problem while placing withdrawal request. I don’t know if it is deliberate ploy from Zerodha to discourage clients from placing withdrawals on weekdays or market down days. Please note on time fund transfer/withdrawal are very important to boost the confidence of investors with Zerodha. This is very annoying problem which repeats exactly when time approaching for placing withdrawal. This is second day Iam facing same problem for continuous 30 to 45 mins. What is this service ? Some issues with our server, we are looking at having this fixed asap. Do call up 080-40402020 to place any withdrawal request. Warning this could be long. Fri withdrawals were 100% successful, no need to make phone calls etc, everything worked online. entries being passed between 5pm and 7pm for trades done on a day, could also hamper page load of ledger and funds page of back office during these times(5to7pm). So if you can announce like all ledger entries for trades done on a day, will be passed before 7 pm, hence clients can freely place withdrawals without any failure after 7 pm, would be very helpful for us. I also have a query here – if I place withdrawal request at 5 pm for Rs 15000(funds screen allowed this amount to be placed) and new ledger entries for trades done on that day are passed at 6:30pm, and now withdrawal amount is reduced to 14500/-, what will happen to the request already placed by me at 5pm(and not corrected before 7:30pm) when it is processed at 7:30pm? I have 506.7 rs. Free cash on my account. But in back office shows zero value. How can I withdraw my amount? Can you send an email to [email protected] for this. In my account there is balance of Rs 15,440. Still it is showing no funds the withdraw under request withdrawal option. Kindly clarify this issue. Can it be because I have placed trades during the day time and the brokerage fees and other charges is yet to be deducted or any other reason. All settlements in India if trading F&O happens on T+1 and equity on T+2. So even though the money is available, it may not be clear balance to withdraw. You will have to wait till the settlement happens from the exchange. My backoffice shows that my account balance is rs.1882 but withdrawal balance shows only rs.447.what is the difference between account balance and withdrawal balance.How would i withdraw rs.1882 from my account?? If you have sold stocks exchanges settle on T+2 day. So it will appear on withdrawal balance on the T+2 day from when you sold. Similarly it is T+1 in case of F&O. I am new to trading. I did something wrong and messed up in a situation. 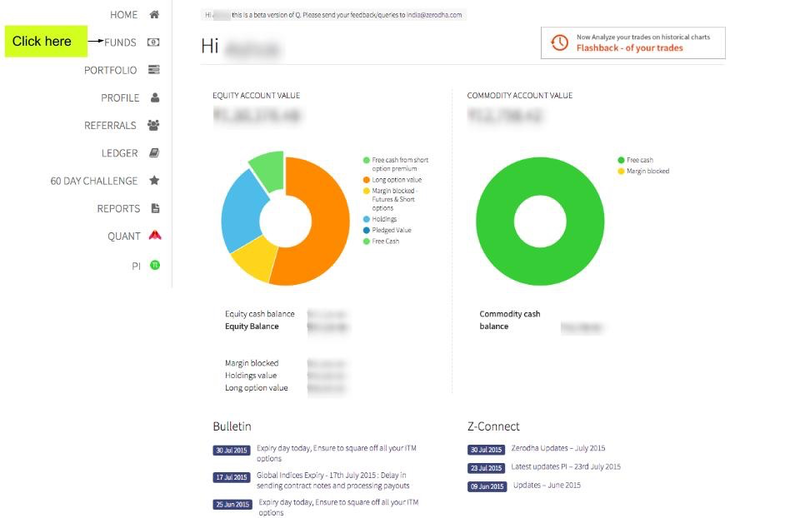 Currently my equity balance is 2425.46(same for equity cash balance) as seen in https://q.zerodha.com/dashboard/. Holdings value : 2,273.15 . How can I move out from these holdings back to cash balance ? After 3rd step again it is seen in holdings. How do I completely move from holdings. Please bear with my questions. When the market opens on Tuesday, just exit from holdings using the CNC option. Iam unable to withdraw (payout) from the back office tool. It shows withdrawal balance as 38434. I try to withdraw 12000. On monday when i tried, it states that your withdrawal is successful. Usually the withdrawal is processed by 9PM and i get a message stating that it is processed and by the next day i get the money in the morning. Of late this back office tool has gone bonkers with lots of errors. This is frustrating. Please look into this. Please can you make sure if i can get the money by tomorrow noon.This is urgent and frustrating as technical errors ruins our plan. What’s the difference between the account balance and withdrawal balance? The difference between the two figures in my account is just shy of a hundred rupees. Account balance is the funds that’s available in your account and withdrawal is what you can actually withdraw. If you sell shares worth Rs.1,00,000 on T day, your account balance would show 1,00,00 but your withdrawal balance would show 0, since shares sold on T day are settled on T+2 day. I can’t withdraw last 1020 rs form equity acc. I am intraday trader and no holdings and never took any share delivery. acc balance is 1020 and withdrawal balance is 0. and it is showing the same status from yesterday. Best if you send all account specific queries to [email protected]. Yesterday(31 Mar 2016) I made withdrawal of Rs5603/-. I received sms at 10:11pm and 10:43pm yesterday that my withdrawal is processed. Today(1 Apr 2016 1:13 pm), the amount is not yet credited to my HDFC SB a/c. Iam worried what has happened to the money because it is debited from the ledger yesterday itself So it is not available either in Zerodha a/c or in my Bank a/c ? Today I wanted to place buy order, but don’t have sufficient balance, because the cash is stuck up with Zerodha ? I think this is the year end issue with the banks. And since today is a bank holiday, I am guessing you will get this only by tomorrow. on my dashboard, it shows Rs. 4907.75 as commodity cash balance, but when i try to withdraw it (from backoffice) it doesn’t show any balance in commodity account. i tried doing this at 12.50 am (00:50), is the issue because of time or is there any other issue, kindly solve at the earliest. The funds are updated to Q after trading hours. You should be able to place a withdrawal now. When I open the back office the top 3 cms height is covered with a blue strip. I am not able to see the first two tools namely home and funds. why ? i tried both in internet explorer and google chrome.I am not able to withdraw the amount. Are you doing this on a mobile phone or through a desktop? Would appreciate if you could attach a screenshot after removing all account sensitive information, would help in resolving your concern. Shares sold on T day are settled on T+2 and cash can be withdrawn on T+2 only. In your case, you’ve sold shares on 13th, settlement is on 18th (Thu,Fri,Sat & Sunday being holidays). You’ll be able to withdraw the money only on 18th noon. my withdrawal balance is showing more than my free cash value its approx 5 times more and around -17000 and my free cash is around only 2000 rs and most important part is I haven’t withdrawal any money since i joined you this is my first time to withdraw money but i can’t due to this problem please help me to understand how come am dealing in negative values without withdrawing any cash. You’ve sold some shares on 13th April, the settlement of which will happen on Monday. You’ll be able to withdraw these funds on Monday noon. Currently my account balance is 8000 and withdraw balance is 146.
i want to withdraw 8000 ,how and when it will come to withdraw balance? You have to login to q.zerodha.com and request for a fund withdrawal. Can I transfer money(pay in) in my trading account through another saving account which is not linked with the trading account? If yes then what’s the procedure? Yes you can, but you will have to send us a proof of your secondary bank account for this. You can courier it to our Bangalore address with a request to add a secondary bank account. I sold some of my holdings, when can I withdraw the amount? ON T+2 day, after 2 working days. My trading acc no DM3185. I want to transfer some funds from trading acc to bank acc. I tried to transfer through q.zerodha.com. But fund & home tabs are not being displayed and these two tabs are hidden below blue colour. request you to resolve the issue. Having this fixed, can you until then use this link: https://q.zerodha.com/funds/display/. You can also zoom out the screen, u will be able to see this. I usually trade in equity on Intraday and BTST basis daily. So daily I do intraday and evening I buy the shares for nextday. I want to withdraw some profits periodically. But everyday the withdrawal balance showing is negative. Do I need to stop trading for 2 days to withdraw money every time? If you buy as BTST and sell the next day, the settlement cycle in India is T+2, so yeah you have to wait for 2 days before you can withdraw these funds. All intraday profits made can be withdrawn next day. Amit, best to send account specific queries to [email protected]. The only way I guess this could have happened if the balance in your account was not clear balance. Is it possible to transfer money from other bank accounts to zerod instead of only from primary bank accounts. If so how ? Yes you can transfer from other bank accounts, but you will have to first get it linked to us. Send us a cancelled cheque of the bank you want to map. If I have Rs 50000 as my portfolio holding then How much margin can I get for Intraday equity trading? Pls answer the below questions. 1) Is it possible to pay in/pay out in Zerodha mobile app, if yes how to do it. I’m unable to see the option. 2) Zerodha q offers only payout, how to pay in..? Why not both options are provided in Q. 3) I called support, they asked me to download the latest mobile app..
App is not available in Play store..
& also App is not downloading in your website (error is displayed). 1. Click on the menu option, you have a link to funds. Once u r in funds there is an add funds button. In the fund withdrawal screen, the account balance shows as 4017 but withdrawal balance shows 3123. Why is this difference? The Rs 700 could be shares you have sold (settlement in India is T+2 for this, so if you sell shares today, you get money from the exchange only day after) or profit you have made from F&O or intraday trading(settlement happens next day or T+1). I have placed a withdrawal yesterday, amount has been deducted from my Zerodha account. Not yet debited to my ICICI account. Yeola, banks are closed today (2nd and 4th saturday of the month). This credit will happen only monday. All withdrawals are processed in the morning for commodity, so you should get by evening. If you’ve transferred funds today, it’ll get updated on Q by EOD. However it’ll be updated on the trading terminal right away. Check this: https://kite.trade/docs/kite/#funds, you can use the payment gateway. Firstly, congratulations on the great work done and the work in progress. Have switched to you guys a couple of weeks backs and I am quite happy so far. Secondly, coming to my query, I see that there is almost a 1% difference between my account balance and withdrawal balance as visible in Q under the funds tab. I have no open positions right now. Why is this so ? I think I read that it takes Rs 9 to transfer from HDFC account to my trading account. Why is there this additional difference ? Abhiroop, if you have sold shares or any profits from intraday trades, they get settled by exchange on T+2 and T+1 days respectively. That is when this difference can show up. Vikram, withdrawals are only to the primary account. Hey, the fund tab shows a different amount in account balance and withdrawal balance, Why so? Settlement of equity sales happen on T+2 days, and F&O on T+1. So if there is any unrealized credit from this, you cannot withdraw until settled by the exchange. What is “Being Payment Gateway Charges Debited” in ledger and how its calculate? Rs 9 + service tax is charged by our payment gateway provider everytime you use it to transfer money to the trading account. Nothing to withdraw. Sir I have trading account with religare securities and 300 shares of Infosys. How can I Transfer all my shares to Zerodha Account? Religare would have given you a delivery instruction booklet while opening the account. In that mention your Zerodha demat account details, and submit it to them asking to transfer. i m not able to cancle withdraw request.what to do? My zerodha account was activated on 19th July. I had transfered just 5k initially. After trading for couple of days the account balance is now increased. But in withdrawal menu I am not able to see any withdrawable balance. Not even initial 5k which I transffered! m unable to put a withdrawal request as it is showing NA since couple of weeks now pls help me out. I’m also facing the same problem. Not sure what to do. Pintu, you can use NEFT/RTGS/IMPS to transfer funds to your trading account, you can withdraw using Q yes. Pradatta, you can place withdrawal request, the funds we are having some issues. You can login to Kite or pi, check your balance and place a withdrawal request on Q until we fix in the next few days. Ok thank you for fast reply and information have a nice day. Is fund transfer from Union Bank of India or PNB to Zerodha possible using instant payment gateway? No, but you can just use IMPS from your online bank for this. If you have sold stocks, exchanges settle it in 2 days. So until then you can’t withdraw, you can use it for trading only. q backoffice is not opening..
Account balance includes unrealized sales from stock selling and any profits yet to be credited. My equity account balance is 2626. but its showing withdrawal balance as 301. I trade only in options. Friday square off does make any difference as such? Kindly assist. I am guessing that you have sold an option, the money realized form selling an option can be withdrawn only after T+1 day. Jahir, today is the 4th friday and banks are closed. Hence the credit will happen only on monday morning. We mention about this on the fund withdrawal page. I can see that the margin available in my account is 8221 margin used -4675. But whenever I am trying to withdraw fund it is showing that insufficient fund , What can I do ? Puja, I am guessing you must have sold some stocks yesterday or booked profits/exited from F&O trades. In such case funds are settled by exchange only on T+2 or T+1 days respectively. You can withdraw only after that. I am guessing you must have sold some stocks yesterday or booked profits/exited from F&O trades. In such case funds are settled by exchange only on T+2 or T+1 days respectively. You can withdraw only after that. hello sir, am Ravi how we place a target order in coverorder. is it possible in coverorder or not? Target not possible. You have to exit the cover order. I have something to know that when I with row total money then my trading account balance goes -8… Rupees . Now today I left rs 4.81 after trading then I see again account value goes -8.67 or something. Why? I see two options in zerodha for managing excess funds. 1 – over quarter its not used, it will be back to bank account. 2 – it gets parked in overnight debt fund. may i know advantage of parking it in debt fund? will I earn any interest on this? It’ll be parked in the debt fund overnight for 1 day and you’ll get such interest for 1 day. How to change the bank Account ? Send us a copy of your other bank cheque or original bank statement with a covering letter asking to add this account. sir… i placed withdrawal request yesterday ( Friday at 6 pm ) in equity . i got the message from zerodha that your withdrawal request has been processed at 8 pm same day. but i don’t receive cash in my account ill now. today is week off Saturday. Banks are closed on second saturday, hence you wouldn’t have received. We make a note of this on the funds page on Q. With reference to RBI circular- https://www.rbi.org.in/scripts/FAQView.aspx?Id=60, where transaction charges are applicable to remitter for NEFT/RTGs how Zerodha waive off charges on withdrawals? We give enough business to HDFC, hence they waive off the charges on this. We’ll explore that option. Payouts are processed from our end the day it’s placed, provided it’s placed before the cut-off time. You can check your ledger in Q.
i have recently opened opened trading account with Zerodha, MY HDFC account is linked with Zerodha. i am using Kite app and transferring amount through funds option. I want to know is there any way i can save on transaction charges for money transfer from my bank to Zerodha account. However note that credit isn’t instant. I am regular commodity trader of Zerodha, Yesturday i have called up to your customer care, but they can’t give proper answer/solution to my queries. When i have to go to your Kite Dashboard at there it is buy window on Zinc Script, there is different option which is MKT/LMT/SL/SL-M.
My question is When I Want to purchase the Zinc for Rs. 100/- X 10 Qty (MIS) with the Stop loss of 90/- then which option i have to choose. Whether i have to choose the SL & fill Rs. 100/- value in Price Column & Stop loss to be filled of Rs. 90/- in Trigger price column in same window. If it is like that means it will work like when the market price of Zinc will come to 100/- system will automatically buy the desired mention quantity & after buying the commodity at 100/- if the market price is goes down to 90/- it will automatically sold that quantity to reduce further loss on commodity. If there is nothing like that, kindly guide me with some example, because i have gone though your support centre FAQ section, but it’s not that much clear about the kite software handing. Hope you will clear my doubts about SL kite handing. I suggest you go through the SL blog here: http://zerodha.com/z-connect/tradezerodha/zerodha-trader-software-version/stop-loss-orders-limit-market which explains how to place Stop loss orders in detail. 2. Upon execution of the first buy order, place a SL order where the order type = SL-M, and the trigger price will be 90. The moment the stock hits 90, your sell order will get executed at market price. Please don’t place SL-M orders for illiquid contracts. Is it possible to withdraw complete amount from Commodity account. You’ll have to place the request from Q. If we put withdrawal on Friday and Monday is a holiday….when would the withdrawal processed? never believe any business man. I transferred funds to trading from SB account. among 3 razorpay methods via netbanking method it was not paid. through card method it was paid. again in equity funds transferred amount only is showing only in margin balance. remaining balances are zero. I cannot withdraw money. it is showing equity account value zero. insufficient equity balance. If we transfer huge funds to trading account what will be our position. transfer to trading account is easy, withdrawing is very difficult not like they say. they will put it in margin..etc features. I lost trust in Zerodha. Hey Siva, I think you are confused, can you send an email to [email protected] with your client ID. Someone will call you back and help you out. Razorpay gateway is for paying account opening fees, to transfer to your trading account you need to use https://kite.trade//docs/kite/#funds. I say transfer on razorpay means Ac opening fee. it was done only by ATM card method. after transfer of funds to equity from SB account it appeared only on available margin, remaining balances zero. now even available margin is zero. yesterday I received message showing funds are available for trading from tomorrow but all balances zero now. you should first say about the distribution of transferred funds in margins, available balance to withdraw etc. all is hidden and you put it in various headings like available margin, equity cash etc as u like. Hmm.. still not able to figure what you are asking for. I am getting one of our team members to call you back. OK thanks sir. problem solved. now balances are showing correctly. total account value is not zero now. what is difference b/w account balance and withdraw balance ? I have account balance of 12000 but only 2400 it is showing as withdraw balance ? When stocks are sold, the credit of funds happen on T+2 days. Until then it will show as account balance, since these funds can be used to trade more and can’t be withdrawn. I did not daily login in smallcase and i saw there is rebalance update. if you start sending msg alert for rebalance update it will help us to take action on time and it can cause loss if delay in action. Stocks get settled on T+2. I have some amount in “Available Balance”. When it will be converted to “Withdrawal Balance” so that I can withdraw it? If this is from selling stocks, it will take 2 working days. All settlement on Indian exchanges take 2 days. When you sell a stock or make profits intraday, it gets settled by exchange on T+2 day and T+1 day respectively. Until then, you can’t withdraw this money (it is not clear balance), but you can use this to buy more. I have one more query, my traded value for 02-12-2016 was ₹235030 but I received message from NSE saying that my total traded value is ₹470060 (which is double of actual). Later I received mail from NSE and Zerodha confirming that my total traded value was ₹235030 only. Should I need to worry about this. Is there any technical glitch at Zerodha or NSE? I think there was some issue with NSE end yesterday, many clients got double the traded value in the SMS. My wife and myself have separate trading account with zerodha. Can we transfer some funds or shares from one account to other? We can avoid many unnecessary back and forth transactions. Funds can’t be transferred. Stocks, yes, but you have to use delivery instruction booklet for this. Do you have some debt fund where we can park some amount till we need them for right trading opportunity? How to access details of it. Thanks for the information. What is procedure to order liquid bees? Is it like any other order? Do we get interest or trading has risk. We do not wish to take risk in such trade. Check this to learn more on liquid bees. Nikhil sir I want to know that suppose I will apply for my payout at second Friday of month before 7:30 PM . Then when will be amount transfer to my bank account. Will i get in Saturday? Rahul, if you have HDFC bank, you will get saturday, but for other banks only on monday as banks are closed. Is this any way to see withdrawal history? Yes, go to ledger on q.zerodha.com, you can see the entire history. I transferred funds from my ICICI account to my ZERODHA account at around 9 pm today (9 Dec). The same is yet to show in my commodity section of Margin availability. Whom should I contact ? My account balance is not replicating on withdrawal balance. How many days will it take to replicate??. I buyed some share & selled it. The balance got replicated on account balance but it’s not replicating on withdrawal balance. All settlement in India happens on T+2 days, so 2 working days after selling. 1.Sir, is it possible to transfer funds to my linked bank account through kite mobile app..if so how? 1. From the menu, you can access the “Funds” link and click on “Add” to transfer funds. my account balance and withdraw balance are showing different amounts. Why is it so?? Account balance includes such sums of money that aren’t cleared yet. Eg: Proceed from sale of equity shares gets reflected in account balance on T day but shows up under withdrawal balance only on t+2 since equities are settled on t+2. If I will put request to transfer fund from demat to sb account on 1st or 3rd Saturday working days. Is it possible to transfer fund on same day from equity. Amit, our funds team doesn’t work on Saturdays. So it will happen only on monday. If you intend to withdraw on saturday, best to put the request on friday. If you sell shares, the money gets credited after 2 days from exchange. You can withdraw after that. If money is lying idle, you can withdraw it anytime. Hi Can you plz tell me if i can open a demat account offline at any of your branches in delhi. hi, my userid DR2118, just want to know why every time my balance is shown less then actual and every time i have to call and get it corrected and the answer i get that the balance figure was not updated….! whats it means ? every time i have to keep track record of my balance ? and call to correct the same ? Hmm.. all processes are automated and you don’t have to call us for anything. I am guessing you must be checking your balance when our trade process for day is running. I will get someone to check this. I got a message from post that my application for account opening received by you today. 1. when can I expect my account to be activated? 2. How much further time it takes to open demat account? 3. Can I trade in equity intraday without demat account? my account balance shows 10325.56 and withdrawal balance shows 9713.45..???? whats the difference and which amount can i transfer ???? Withdrawal balance is what you can take out. The remaining would be most likely either todays profit (settlement from exchange happens on T+1) or proceeds from stocks that you have sold (T+2). So if you have sold stocks, you can withdraw this money after 2 days. I have two bank accounts registered with my trading account. During withdrawal of fund is there any way i can select which bank account i would prefer the funds to be transfered into. Withdrawal is always to the primary account. Is there anyway I can change my secondary account to primary account. Primary account is the account to which we process all payouts. It’s for this reason that we always insist on collecting an original proof of the account (check copy) to map it as a primary account. Secondary account can be mapped by providing a scanned copy of the bank proof. We’ll need an original cancelled check leaf to map an account as primary, unless that has been provided, secondary can’t be changed to primary. I am a new zerodha user, I tried logging in to q.zerodha.com, most of the time since yesterday it showed ‘502 Bad Gateway’, and sometimes when it did open my password is always showing incorrect, but I am using the same password to login kite. Login to Kite and Q requires separate passwords. Can you go to Q from within Kite and see if it lets you login. why is it showing bad gateway 502 error! why the withdrawal balance is 3.53 inr. i want to withdraw my account balance to my bank account but withdrawal balance not display properly??? If you have sold stocks, it takes two days before you can withdraw. Settlement cycle in India is T+2 days. Until then it won’t show on withdrawal balance. My equity and commodity account balance shows N/A because i am new user and havn’t traded yet but transferred money from my citi bank to zerodha, if i want to withdraw that fund what is the procedure? Login to Q.zerodha.com click on funds and hit withdrawal. Hiren, withdrawal is blocked while the trade process is running (between 6:30 and 8). Check back after a while. Should work fine. This is only for a few days. Sir facing lot of problems with back office,not updating funds,not able to place withdrawals,open positions not showing.Nobody to rectify,have called customer care so many times and complained but of no use. This issues should get fixed by end of this month. Cancelled cheque for my registered bank account? Yes you need to courier all of that. I placed a withdrawal request. Primary account is the account to which we process all payouts. It’s for this reason that we always insist on collecting an original proof of the account (check copy) to map it as a primary account. Secondary account can be mapped by providing a scanned copy of the bank proof. Since there are additional measures to verify the primary account, as a policy we process it only to primary account. How much is the withdrawal charges, if any? per withdrawal or per 1000? Hey, Rakesh. There are no withdrawal charges. Hi, I added some funds to my zerodha account via Kite transfer. I got the amount and could see it in Margin Available. But the amount has reduced now. I wanted to know why the amount has been deducted from my account. Also, the withdraw link is broken, I always get a message 502 payment getaway error. Sushil, can you email [email protected] with your client ID. Someone will check and get back to you tomorrow. Is it true that if my trading a/c balance is less than 10k then I can’t transfer that money to my bank a/c? Not true. Even if have Rs 1 as balance, you can withdraw it. Hi, I am overall happy with zerodha, I just want to know do we have any option to check my day to day to profits and loss history. I tried checkeing but it is not showing day wise. You can go to Q.zerodha.com, check these posts. What if I want to invest for longer term and stay invested for 25 or 30 years when I will sell all my shares. What if Zerodha closes its firm before that duration supposedly any worst case? Hope my spendings will remain intact and in safe hands. Please reply I am new to trading. Amit, all these shares sit in your demat account with CDSL (depository). So even if we were to close, your shares will be sitting in your demat with CDSL. I have sufficient cash and request withdrawal around 11am on Thursday(30-03-17) and received SMS at 1:58am(31-03-17) that your withdrawal request for Rs.50000.000 has been processed but till 8:06 pm has not received. 1.Have discussed with Customer care at 9:40 AM (31-03-17) and get update it will be credited to bank account before afternoon. Just ask one query if will do intraday and apply withdrawal before 7:30pm is it possible withdrawal can proceed. But received replay “No” .So then have to understand not do trade when withdrawal money.Have some confuse and waiting for replay. The payouts have been processed from our end. The delay could be because of the increased transactions on 31st March, people trying to pay taxes, companies processing salaries etc. You can withdraw funds from your trading account as long as they are free funds. I am very much pleased by the service which is provided by you all inspite of such a low brokerage. But if possible Please include a Mandate option in which funds could be transfered into zerodha account much easier and with no transaction failure. I have invested in some share and took the profit out of it ( Sold shares ). Now I still didn’t withdraw profit/money from zerodha to my back account. How can I calculate TAX on this ( 15 % for short term) as amount is not yet transferred in my bank account? Also I am facing lots of problem in backoffice while exporting transactions/ profit/holding reports. Its so slow. Chetan, we have just replaced a big piece of code on backoffice. It should start working correctly. Can you check out the tax P&L on Q. Tax has to be paid only end of the year while filing your income tax returns, not on every trade. Hi I am using my client ID and trading password to login to Zerodha q, but it is showing wrong ID/password. However I am using the same to login and trade at Zerodha kite. I don’t understand why isn’t it working at Zerodha q. Please help. When you login to Kite, you’ll find your client Id on the top hand right corner. When you click there, you’ll find an option called Q -Backoffice. Click that to login to Q without being asked for any user name or password. Dear zerodha, I was put withdrawal request of ₹20000 before 7:30 pm tomorrow 13-04-2017, balance was deducted from my zerodha account but balance is not receive in my bank account yet. Kindly highlight and solve my issue plz. There is no issue; your payout has been processed from our end. You should receive the funds tomorrow since today is a NEFT holiday on account of Ambedkar Jayanti/Good Friday. Hi. i have opened Zerodha account in January 2017 and i was happy with the service and brokerage plans provided by it but i have noticed one grave error on your side that i had around 30 k in my account in fund value section after market hours on 12 April 2017 but it was showing as Rs 700 since yesterday without any trade.How can it be possible? Where my 30 k has gone? When i checked Ledger statement it is also not showing 30k transferred from my HDFC bank account to Zerodha on 1st April 2017.Bizarre.I have never faced this type of issue till now.It is quite a serious issue and i really lost my faith in Zerodha . i hope that this issue would be solved ASAP with a valid explanation.I already sent a mail regarding this but i dint get any reply till now. 2525 & 900 have been credited to your account, please check your ledger on Q.
yesterday around 3pm i transfered 5000 but today my balance in trading account is zero why???? Please email [email protected] with details of how you initiated the transfer. I love Zerodha and I am new customer – but I think Zerodha is misleading the customer base somewhat with the information. I just started using coin and invested more than 25,000 and I see 57.60 already debited. But your Coin Website is giving mislead information that 50 Flat fee per month. Can you clarify and update your Coin website footer and the charges page (https://zerodha.com/charges) to reflect the true cost (including service charges)? It looks like your tacking a 15% service for the Coin Subscription – Is this true? If demat also adds a service charge – Total cost will be 1035 per year just for Zerodha Platform. That looks a little steep, but I understand your a for profit business and I am ok. But please update your website and footers and at least put a * saying 50/month + service charges. No intention to mislead Jay. I’ll give your feedback to the team. I have not got funds credited to my bank account today. As my withdrawal request was processed yesterday itself please check. Dear AKSHAY VENUNATH KULTHE Your withdrawal request for Rs. 50000.000 has been processed. Akshay, the banks are closed today due to 4th Saturday and hence might be the delay. i put fund in my zerodha dement account and i not trade still now , now i wnat to withdraw fund from zerodha dement ac to my bank account. what procedure / explain sequence of steps. Go to q.zerodha.com > funds> withdrawal request. how to link multiple bank account for fund transfer? I have 51k in my margin but my withdrawal of funds shows only Rs.500, why is it ? If you have booked profits or sold your stocks, it can be withdrawn after 1 day or 2 days respectively. Settlement cycle on exchanges is that. If you have profits from yesterday, or if you have sold scrips/F&O positions they get settled only in 2 days and 1 day respectively by the exchange. You can trade more with it, but you can withdraw only after this time. How much time does it take for the funds to update on q, so that I can withdraw? There seems to be a disconnect. My app shows more free cash. For ex: my kite app shows free cash and total value as x. But when I try to withdraw it’s showing ( x-last days profit ). Ok, I found the answer in the same thread. Thanks! Can I use union bank account for transfer money to my zerodha account. Pls feed back me through mail. How can i find the historical funds addition and withdraws in Kite or Q-Back office. Please tell me the way to find this. Go to Q, click on ledger, enter your dates to see this. I deposited funds from my other bank account via IMPS not knowing that such a transaction is not valid. By when will my money be refunded? You can send your other bank account proof and have that mapped to your trading account as well. Otherwise, send an email to [email protected] asking for refund, should happen within 2 days. Your support team helped me map the bank account to my trading account. When my “Margin Available” will be available for Withdrawal?. If you have sold stocks, after 2 days. If you have booked profits from F&O trades or intraday equity, after 1 day. can I withdraw money through imps .? if yes then how much time it take .? Withdrawals are done using NEFT. So time taken as explained in the post above. Is there any charges application for Fund Withdrawal ? If yes, how much ? *Is there any charges applicable for Fund Withdrawal ? If yes, how much ? Am interested in opening an account with your organisation , is there any branch / office in Kolkata. I put order for redemption for Debt fund on monday, It was showing T+1 as settlement and showing in my account on tuesday. However when I was using withdraw option the fund was not available for withdrawal. I talked to client support and they told me it will happen by 6:30 and then you can initiate the withdrawal which will be credited to your account by wednesday as I am holding an HDFC A/c . However fund was not settled till 9 Pm and was only reflected in today morning, Now when I put a request for withdrawal , It was told to me by support that it will happen by tomorrow. The interesting part is client support, I was trying to connect from 10 AM however no one was picking it after ringing for 5 minute one lady picked up the phone , When I explained the issue she told me that she will transfer the call to Funds department instead she disconnected the phone. Again after ringing the call and listening to noisy music for 5 minutes, One gentle men picked up and told be It won’t be possible to add funds till evening. I am CA and owner of a start up hence, It is really a feed back to improve upon these else these fake gimmick will not work in long term. sir friday ko withdrawal requst dali to starday ko account amt aa jayegi? Yes, but if 2nd or 4th saturday when bank is closed, then only monday. I placed request today afternoon but my request rejected due to insufficient balance. Why this happed??? If you have sold shares or made profits, they can be withdrawn only after 2 or 1 day respectively. Exchange takes time to settle those. While adding funds bank charges are now applicable, are there charges from bank on withdrawal of funds as well? No, only if you are adding funds using payment gateway. If you add using NEFT/RTGS/IMPS, it is not. What is realized profit and margin used showing me negative……profit is not showing in my total value…what is the concept about it ????? Realized profit gets credited only the next day by exchange, margin used is blocked for the position you have taken. So both can’t be withdrawn. I requested a withdrawl amount yesterday(14th August) before 7 PM .when can i expect money into my bank account? Since banks are closed today, guess only tomorrow morning. Have you accounted for call and trade charges of Rs.47 and payment gateway charges of Rs.10.62? You can check your ledger on Q to verify these entries. Is it true that we can withdraw only an amount greater than Rs 10,000 in case of equities (Rs. 50,000 in case of commodities) from the trading account? What if I have only Rs 8,000 left and need it all ? Forgive me if it has already been asked. No Mihir, no such restrictions. You can withdraw even Rs 1 if it is in your trading account. There has a restriction! I had tried because my fund balance was only ₹ 18.00 and I want to remove it but while withdrawal requesting it shown me Min withdrawal balance is ₹ 100 or more. That is why my transaction got failed at that time. I was unable to withdraw a single rupee from that ₹18.00. So sir please don’t say it again. Hey Harish. Sorry for the confusion. The above answer seems to have been only in context of the example quoted. We do have a restriction on withdrawal of funds wherein only withdrawal requests above Rs. 100 are accepted. Only in cases where the fund withdrawal is unavoidable (at the time of account closure, etc.,) we allow withdrawal of any funds. Sir i had raised a fund withdraw request yesterday in the afternoon. When will the funds be credited to my bank account ? You should get the funds in a few hours. My commodity balance is 4989.38. I tried to withdraw. it says insufficient balance. what to do? Requested yesterday morning for withdrawl and Got message from your side as “Withdrawl request processed successfully” yesterday night .But still now amount was not in my bank ? Yes same in my case still not received funds in my bank ! i sold my holdings and can see that they are sold, but still i cannot see the equity value, hence not able to withdraw the funds. When you sell holdings, you can withdraw it only after 2 days. Exchanges take 2 days to settle. I have initiated the withdraw of funds in the morning at 7 AM. Still its under processing. All withdrawal requests are processed only once end of the day. I purchased one scrip with CNC on 8th September. It went to holding when i see it today,now nothing is happening in that like scrip is increasing but i can see it is still at same position. and even i can not see the withdrawal for that amount. I am new to Zerodha. Please help me and guide and i tried to call your customer care number that was not working i think. Best to write to [email protected] for this. I am guessing it could be short delivery, in which case it will show next day. Check this. When you bought and the person who sold you defaulted. Exchange settles those shares 1 day late. I have TOTAL ACCOUNT VALUE as 23,662 rs. I want to withdraw this amount n transfer it to my bank account. I had placed withdrawal request but it gt failed due to insufficient balance but i have balance. Can you guide me to withdraw this amount to my ban account. You’ll be able to see the values by eod. You can check the ledger to check the balances for now. Sudarshan, 2nd and 4th saturdays banks are closed. Hence withdrawals take time. I applied for withdrawal buy i got message “your withdrawn request has been rejected due to insufficient funds “. what is minimum withdrawn amount ? You could have requested the payout without accounting for the day’s trade along with the charges. You can check your ledger in Q and place a withdrawal now. I transferred 23 k today morning.. and tried to withdraw 5k in evening.. but my account is showing only 660₹ which was there earlier… When will the 23 k be credited?? Send such queries directly to [email protected] with your client ID. Akshay, please write to [email protected]. I don’t know my demat account no. where can i get it. And how much time does it takes to sync q account. Last night I got my client Id and password, I login in it and tried to add some money into it, but i came to know that my a/c no. is not linked with my demat a/c. I don’t know what to do please help me. Inderjeet, you can find your DP ID under the profile section of Q. You account will be linked but may not be supported for instant fund transfers and hence you won’t able to see it when you try to add funds. You can find a list of banks we support here and if your bank is not part of the list, you will have to add fund through NEFT/RTGS or IMPS. You can find the beneficiary details here. I need to change by Bank account in my profile but i was not able to change it. can anyone please help me how to change the bank account so that I can withdraw my money. To change your primary bank you will have to send us a duly signed account modification form which you can download here along with a personalized cancelled cheque/bank statement. I HAD SOLD IPO SHARES OF GODREJ AGRO @ 615.6 QTY-1740 SHARES TODAY. WHEN CAN I EXPECT THE PAYOUT FROM ZERODHA.. MENTION THE PROBABLE DATE FOR ME TO UNDERSTAND THE PAYOUT DETAIL. The settlement cycle in India is T+2 days. That meaning you can withdraw your sale proceeds after T+2 days. Best if you write to [email protected] for account specific queries. I applied for withdrawal which was available on 19-10-2017 Thursday evening 7 pm, expecting the money in my account the next day, i.e. Friday (banks being working) but not have got it and hence cancelled on Sunday. Any answers? Vamsee, Friday was a bank holiday. We had put up a bulletin for this. I was not aware of this, but its OK. Thanks. Note: If we had an email (or SMS) we would have known easily. Vamsee, all important announcements are put up on bulletin. I want to change my bank account details.can you please guide how i can do that. Arihant, You will have to courier us a duly signed account modification form along with the personalized cancelled cheque or bank statement of the account wish to this address. You can get in touch with our support desk for more. How do I check all the transaction details i.e. complete deposit and withdrawal details so far done from my end?? Shrekanth, You can check your ledger in Q.
I have added funds to my account in morning and it is reflected in Kite also. Now i thought of withdrawing it. So when checked in Q to withdraw the i am seeing the funds which i added. The Balance is nill. You should be able to place a withdrawal request tomorrow. I have linked two bank account with zerodha. Now, I want to withdraw some amount. After withdraw in which bank account money will go. I want to select bank account also. The funds will be transferred to the bank account linked to your Zerodha account. No, you cannot choose the bank when placing a withdrawal request. i have deposit 5000/- today morning. in same day I would like to withdrawal the funds for some emergency, unfortunately funds are shows nill in Q. but same amount shows in trading account. how can i get these amount to my bank account. tomorrow will be Saturday. the deposit amount credited in trading account with in 10min but not updated in Q takes lot of time. hello i am trying to withdraw money from my trading account since a week and i do it on weekday before 7pm , i did it on tuesday at 4 oclock, still i havent got the money in my account, whats the problem? Best write to [email protected] with such account specific queries. Can we cancel the withdrawal request after 7.30 pm ? I’m unable to withdraw my funds even after multiple attempts. i have deposit 20000/- today morning. in same day I would like to withdrawal the funds for some emergency, unfortunately funds are shows nil in Q. but same amount shows in trading account. how can i get these amount to my bank account. tomorrow will be Saturday. the deposit amount credited in trading account with in 1 minute but not updated in Q takes lot of time. Mayur, funds aren’t updated in Q in realtime and are updated on an EOD basis. You can place a withdrawal request tomorrow. If you’ve used these funds for trading on the same day, the settlement is yet to happen. You can withdraw on T+1. Can you check now? You should be able to withdraw. Can I know the charges Zerodha take by withdrawing our money? Hey Neeraj, no charges for fund withdrawals. I have raised withdrawal request after 7:30 pm on Second/ Fourth Thursday for equity. When will my request be processed and NEFT initiated? I am not able see an option to request a withdrawal on the funds page on Q.
I am seeing “Trade process is underway, please place requests later” message. What should I do to request a withdrawal? Hey Vishal, withdrawal requests are blocked when the trade process is happening. Best check after a while. You’ll be able to place a withdrawal request. Why is it that the trade process has to underway on a Friday , and during the period which blocks the withdrawal period, I still can’t place a withdrawal request today. Sumit, trade process has to happen every weekday. We’ve extended the withdrawal window to remain open until 8:30 so you can place requests after the trade process. Date is 27th December 2017, Wednesday. Time is 8:15 P.M. now and it shows that the trade process is underway. Is that an error? Same issue I Am facing. I sold my shares today. But, I am not able to withdraw money. Once you sell shares, the proceeds of the sale can only be withdrawn after T+2 Kranthi. I have raised a withdraw request on Friday at around 2 PM dated 24th November 2017 but still it is showing as pending request. Really pathetic services and not delivered as promised that ”Equity trading account will be credited within 24 hrs”. 24th being the 4th Friday, though the request was processed from our end, it takes time for the credit to hit your bank account. I believe you’ve received your funds by now? today(30th November 2017) i wanted to withdraw some amount , so i logged in 40min before 7:30 pm ,but box in which amount is entered is NOT available. if there any reason like tomorrow settlement holiday? I have raised a withdraw request on Saturday dated 2nd December 2017 but still it is showing as pending request. and its been told that ”Equity trading account will be credited within 24 hrs”. Can you share your client ID in an email to social[at]zerodha.com? What happens when i requested the withdrawal but money has been used for buying share. Your withdrawal request would be rejected. In the kite app my fund is around 12k but when I clicked withdrawal option then in the q.zerodha.com my fund is around 9.5k why it is like that? If you’ve sold any stock today, you’ll see the funds available for trading on Kite, but in reality, these are settled on T+2 by the exchange and that is when you can withdraw. Hi, This is Nitin (YH9397) I’ve added 10k on my commodity and 10k in Equity account. but funds are not showing in QZerodha. pls rectify. Hi.. I have 2 bank accounts updated in Zerodha profile. When I withdraw funds, which bank would be credited? Hey Mayank, the account linked as the primary account will be credited with all the withdrawals you make. I am new to trading, there are many things which are confusing. Just wanna know is there any tutorial/sessions organized to understand the basics of trading. What are the charges which will be debited when I transfer Rs.1000 from my equity account to bank account? No charges for withdrawing from your trading account Anirban. As for selling stocks, DP charges of Rs. 13.5 applicable per scrip if you’re selling from your demat holdings. No charges for intraday/F&O trades though. Just to add this, i am currently out of country. Can i send a request through an email with the required documents in soft copy? Appreciate your quick response. You’ll have to change the primary account linked to your trading account to change the account where withdrawals are credits. Courier this form along with a personalised cheque or bank statement for the account you want to be the primary bank account linked. Unfortunately, an email wouldn’t suffice. Here’s why. Hi Zerodha Team, If I sell a stock on Wednesday can I place witdrawal request on Friday evening before 7:30 ? Will it be processed on Saturday as NEFT works on Saturday? Yes, you can. Provided it’s not a 2nd or 4th Saturday. I can see the time limit for withdrawal is 8.30 pm. But when I tried between 8 pm and 8.30 pm, it kept on saying “Trade process is underway, please place requests later” and didn’t allow me even though I was trying before your cut off time. What kind of a logic is that? Hey Navas, this was a one off where the trade process ran longer than normal. Shouldn’t be the case every day. 1) I have opened the trading account yesterday through online by paying Rs 300 and message received is within 24-48 hours your account will be activated. is it takes working days 24- 48 hours or from day account opened ?. 2) Do I need to courier only the Power of Attorney form after signing ( which has 2 pages ) or do need send the KYC form which i received after e-sign equity (has 16 page). Do i need to pay any additional charges ? 3) After sending the POA how many days will take to activate the DEMAT account ? . My request for withdraw of money from my trading account is still pending for last three days. Please help. It wouldn’t have been processed over the long weekend. I hope this was processed since? I exited a stock but when I go to Funds Withdraw I do not see that my balance has increased, instead Margin available has increased on the Dashboard. How can i get the money in my bank account by exiting a stock. You receive cash from stock sales only on T+2 and that’s when you can withdraw it since the actual settlement of delivery sales only happens on T+2. Is there any charges for transferring amount from trading account to bank account. I have transferred funds to Zerodha, it is reflecting in payin but, now I am unable to see in the margins and transfer it back to my bank account. How do I transfer my funds back? Hey Altaf, withdrawal requests placed on the second and 4th Friday hit the bank account only on Monday as the banks are closed on these Saturdays. Since we’ll have processed the payout on Friday evening, the funds won’t show up on your Zerodha account. i tried to withdraw funds yesterday. the amount was exactly what i had as free cash still i got a message from zerodha stating insufficient fund balance. what is the reason. Possible that you’d made some trades in the day? The funds available change on Q after the trade process. Hello sir, I have put fund withdrawal request. I was using ICICI Bank account earlier, that i have closed few months ago and request for change in bank account has been sent along with documents (i.e. cancelled cheque of new bank account) and all. I have given new bank details ( of Axis Bank) through which i added some funds. At the time of adding the funds kite was also showing me old bank details which i have requested to change. I am not sure about whether old bank details has been deleted or not. So i request fund withdrawal in ” New Bank Account i.e. Axis Bank ” only. Did not find any contact details regarding this hence posting here. Pls do the needful. Best write to support[at]zerodha.com with this. In any case, I can assure you that the funds will only be transferred to the mapped account. what is the minimum amount we can withdraw from trading account? The minimum withdrawable amount is INR100. not showing any text field to enter amount and also not showing submit button, tried in chrome and mozilla as well. Can you write to support[at]zerodha.com with a screenshot and your ID? I tried at 7PM,8PM and now at the time of writing this its 10:30 PM. How much time zerodha takes to process trade? I placed fund withdrawal request on 13.01.2018 Saturday, but it would have been processed on Monday. I waited till morning of 17.01.2018 thinking that it will be processed. But then I cancelled that request, and instantly put new request at 10.00 am as it will be processed same day. Till writing this at 11.23 pm it is showing as Pending Request. How long does it take for requests to be processed? They say equity fund withdrawal is processed the same day, how so? Best write to support[at]zerodha.com with this Devanand. The withdrawal request is processed around 7.30 in the evening and the funds are credited to your bank account by the next day. I believe the payout request was placed on Friday and processed by Monday? The money which we transferred for Margin in Fund from our bank. Can we request withdraw for the Same ? My NRE account (in standard chartered bank) is linked with ZERODHA for fund transfers, now i want to withdraw my funds from ZERODHA to my bank account, but this being a NRE account so only foreign currency can be remitted in the account. How can i transfer funds from ZERODHA to my bank account..? I am new to to Zerodha. I have added some amount for trading but my placed order was not executed today so i cancelled that order. Now when m trying to withdraw that amount at is showing Zero in Total value and my amount is present in FREE CASH and PAYIN. Let me know the reason why i am not able to withdraw? I had a balance of Rs 61,330 in my zerodha trading account. I tried to withdraw 60,000 to my bank from my trading account. I got an SMS after 24 hrs, that my request has been rejected due to lack of funds. I don’t understand this. If I put request for withdraw 10000 from my equity segment on Friday before 7 PM, and the next day is second Saturday, When will my Bank Account credit? I placed withdrawal request before 7pm on 3rd Friday, 16th Feb 2018 for Rs 5000. Usually by 9 pm I receive text SMS stating, request processed. It’s now Saturday 12.35 am and I have not received text SMS yet. Q shows Request pending. I doubt if I receive the funds on Saturday morning. I am trying to withdraw funds. But the text box where I enter the amount to withdraw is invisible. Hey Ravi, this happens if you’re trying while the trade process is running at the end of the day. Should be fixed by now. I am having account with Zerodha and my ID is SA0173. I gave a withdrawal request of 1000 some days back but I didn’t get the money still. Where can I track how much i have deposited to zerodha and the amount i have withdrawn so far. Hey Arun, you can check the ledger on Q. As for the withdrawal request not being processed, can you please write to support[at]zerodha.com? Will have someone check this out. Please dont say its expiry day ! that means we can never withdraw on Expiry days ?? Trade process if it takes more time can run after withdraw process ?? Unfortunately, it’s not possible to process withdrawals before trade process as the day’s trades have to be taken into account. I put a withdrawal request today 1st of March 2018 before 4 PM and I’m still seeing it in pending requests. Now tomorrow being a holiday (2nd March) for Holi, when will you process out the fund and when will I receive it in my account? Trade process is still underway with 15min left for the window to close. Does this make any sense ? With the introduction of the cross currency derivatives that trade till 7:30 PM, the trade process is delayed now Arjun. I would like to cancel my withdraw amount. i wanted to withdraw funds, as i am experimenting with this platform, but its showing account balance as 0.0 eventhough i have a minimal amount (1.1) that shows in my ‘equity margin available” box. Is there any minimum amount to withdraw, or is there a time period before which i cant withdraw? Hey Samruddhi. The backoffice is only updated at the end of the day, not realtime. As such, you’ll see the withdrawable amount only after the trade process for the day (post 7.30 PM). Hi. I have just deposited 13K in Zerodha account. Used approx 6100 to buy shares and have balance of 6800 approx. When I am trying to withdraw this amount on withdrawal page, my account balance shows as zero. Why so? Hey Amit, the backoffice is updated only at the end of the day. It’s not a live platform. place withdrawal requests post the trade process in the evening. The withdrawals will have been processed on our end, but since banks are closed, should be credited on your account by Monday. Sir yesterday i mean 28/3/2018 transfered the amount of 26000 but 29/3/2018 balace showing is 18500 after 1500 loss. I tried to withdraw some funds. The place where to enter the withdraw amount (request withdraw) is not enabled. Why it is not enabled…? If you’ve traded today, the proceeds cannot be withdrawn. Details here. I sold my equity shares on 3rd April 2018. I can see the available balance in my trading account. But when I try to withdraw the funds it shows 0 (Zero) in withdrawable balance field. When it will be available and can withdraw my funds? Can you write to support[at]zerodha.com please? I added funds to my NEW account on saturday ,when i check for withdrawal i dont see any amount . Funds that you add are available in our bank account only on the next working day. That is when you can withdraw. I want to withdraw some of amount but could not place it what is the reason and its remaidal measure. Would like to know if there is a an option to see the all the previous payouts done. Hey Rathna, you can check your ledger in Q. What happens if we place a withdraw request and the money is there in margin used? I had placed a withdraw request yesterday and the request was processed, Can you tell me what is happening? Hey Manoj, check this post. My Equity account balance is 12k, I am trying to withdraw this amount , but withdraw not yet processed, since it is not showing in my withdraw balance, showing only in Account balance? its been two days now, and it was in the same state, balance not moved from account balance to withdraw balance? My account balance is 47k and withdrawal bal amount is 2k i sold most of the stocks on 17th April ,when can i withdraw full 47k ? what is regular cycles for withdrawal if i sell stocks and want to withdraw ? When you sell stocks, you can only withdraw the proceeds of the sale on T+2, so for sales on 17th, you should be able to withdraw today. Are there any charges levied if the amount in the Trading Amount is transferred to our Bank account. Please let us know what are the different ways to transfer this amount into our Bank Account, where there are no Withdrawal Charges. I have made request to withdraw and after full day of communication the answer, I have got is .. cancel the previous withdrawal request and make a new one. Felt like you guys are buying time and tomorrow is off and then 2nd and 4th are bank holidays. Kind of 8 days gone. Please can someone look into this. How much time it take to convert account balance to withdrawble balance? I want to withdraw my account balance from in equity row of funds withdraw page. 3. If Rs. 6317/- is the balance then rs. 7000/- has been debited from my closing balance of Rs.13317/- for what reason? because the same has been rejected as per the sms. please explain and process this withdrawal request urgently. I have recently withdraw 100 Rs to check the process of withdrawal but Rs 22 has been deducted from my zerodha account. Rs 100 Credited into my HDFC bank but where does Rs 22.00 goes? Can someone tell me where it goes? You’d have made 2 transfers into the Zerodha account using the payment gateway. These transfers are charged Rs. 10.62 per transfer. The withdrawal is free. Hi, I need immediate money for some urgency it’s available for withdraw immediately in my equity trading account. If I trade intraday future or option can i withdraw my profit plus margin on same day. Also in case of derivatives expiry day when will I be able to withdraw my margins blocked for that trade for nrml position. I open Zerodha Trading and Demat account on 8 may 2018 today 19 may 2018 still i didn’t get my client id or password many times i compliant about that but sales manager as well as call centre said that sir u will get tommorrow. even i submitted my all documents. What is the difference between account balance and withdrawal balance. Can I withdraw only the amount that it shows in withdrawal balance ? Why It takes 2-3 days of time when we withdraw an amount from Zerodha, As I know its immediate to add funds to Zerodha Account and will be ready to purchase instantly as we add. The transaction should be faster from both ways. This is really disgusting to wait for 2-3 days when we are already using lots of faster ways of transferring money from one account to other say UPI. Hey Aditya, withdrawals are still processed once at the end of the day after trade process, and with a good reason. Only once the trade process is done can we ascertain how much clear balance is available in the account to process a payout. While instant payouts are possible, if you take a trade during the day, this situation gets tricky. We are working on addressing this concern and will figure out a way to make this happen soon. Sir my account balance is 6800rs. But it is not withdrawal balance. And i can not withdraw this balance from 1 week. So plz help me for withdraw this balance..
You’ve sold shares on the 25th and received credit. This can be withdrawn only on T+2. That is after the trade process tonight. I believe this is the proceed of stocks you sold? This is credited to us only on T+2, after which it becomes withdrawable. What does negative withdrawable balance mean in Q? Can you explain with an example? My account balance is Rs.200000 but the withdrawal balance is 600. When this account balance will be moved to withdrawal balance. I waited for 2 days.I need money .Urgent. How ever in Kite , it is showing free cash only but not able to withdrawal. Hey Dharmesh. Proceeds from sale of shares can only be withdrawn after T+2, as this is when even we receive the money. You should be able to withdraw after the trade process today. I had transferred 5K from my Bank account to Zerodha in the morning around 10 AM. I see that against the Margin line item in the funds selection. However, I didn’t do any trading for the day and when trying to withdraw the funds back to the bank it was not happening, because in ‘Q’ the funds were not reflecting. I have few clarifications regarding this. 1. Is there a time gap between Kite & Q to withdraw the funds without trading. 2. Is it that we should trade and realise some profits and only which will be available for Withdrawing? Hi Ramamoorthy, Q is updated with the latest values at the end of the day, after trade process. You can place a withdrawal request after this. If lam placed a withdrawal request on Sunday then when the request is completed monnday morning or evening? The withdrawal is processed on Monday evening. i have requested the fund withdrawal on 06th of June, 2018. There’s no reflection of amount in my bank account. Please help. not able to withdraw,amount is showing in account balance but not in withdrawable balance. how can i withdraw? Hey Tauseef, if you’ve sold shares, you’ll have to wait for 2 working days before being able to withdraw the funds as stocks are settled on T+2. I am very disappointing with zerodha. I want my money urgently for medical treatment to my father. I sold my shares equal to 27000 nearly on 19 th, 38000 nearly on 20 th, 1,60,000 on 21 st.
now date 22/06/18 time 11:12 pm. 27000 showing in withdrawal amount, requested for withdrawal on 21/06/18 evening. waiting for money eagerly, but till now money not transferred. I checked in back office, it shows that the request was cancelled. why?. i can not understand. Even after T + 2 day, 38000 rupees not showing in withdrawal amount. I want all my money Tuesday morning at least. Can I ? Please help me. Hey Rajendra, since you sold stocks on 19th, these would be available for withdrawal only after the trade process on 21st (since stock sales are settled T+2). Stocks sold on 22nd, the sale proceeds can only be withdrawn today, since weekends aren’t part of the settlement cycle. What is the limit of cash withdrawal ? I ordered for a withdrawal but the sms which I got that ” Dear KARTIC …. JANA Your withdrawal request for Rs. …….. has been rejected due to insufficient funds.” What’s the cause? I have sold some of my stocks (Equity) and the fund got credited in Zerodha account. But when I try to withdraw the fund, it’s not shown in “Withdrawable Balance”. I’m facing this issue for 2 days (Except Saturday & Sunday). Please Help… It’s urgent. Why is my withdrawal amount shows only about 18% of total amount I have? withdrawal request for Rs. 5000.0 has been rejected due to insufficient funds. This is because when you sell shares, the proceeds can only be withdrawn after two working days as shares are settled on a T+2 basis and that’s when the money actually hits your account.